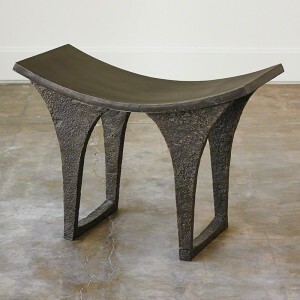 Today’s online interior decorator pick is a very cool stool. This amazing find from Studio A is not your average accent stool. It is made of cast iron with an antique bronze finish. The lines are crisp with the feel of a classic “found” artifact. Modern and antique all in one! Recently, I have used this stool in a rustic living room, giving the new room a time worn rich look. I would also suggest adding a pair to the foot of an upholstered bed frame. The juxtaposition of an iron stool and soft upholstery would be a great look. If you are interested in this stool for your home, please contact me at orders@interiordesignserviceonline.com for pricing information.